The Dingos division 2 squad picked up its third consecutive win on the weekend, defeating the Toronto Rebels by 54 points to remain undefeated. With a heavy wind impacting skills throughout the match, the Dingos were stronger around the contest to ensure that they emerged with the four points. The backline held firm to only allow two goals for the match, while the midfield worked tirelessly to ensure that the Rebels had limited opportunities to impact the scoreboard. Despite their dominance around the stoppages, it took until the dying minutes of the first quarter for the Dingos to kick their first goal through Joel Beasley. Some great rebounding by Rainer Haycraft, Justin Robertson and Kevin Mulholland into the heavy wind helped to set up some offensive bursts, while the hard work of David Giles, Michael Ladd and Alvin Ranchhod ensured that the red and black won the ball whenever it was in dispute. Aided by the hard work of the midfield and backline, Paul Tinkler was able to kick three goals of his own before bowing to the crowd after a great set shot to seal the game. The Div 2 squad now has a well-deserved three weeks off before facing the Central Blues on July 18. As the Division 2 boys celebrated their solid victory, the Division 1 lads made their way to the field to battle both Mother Nature and the Rebels. 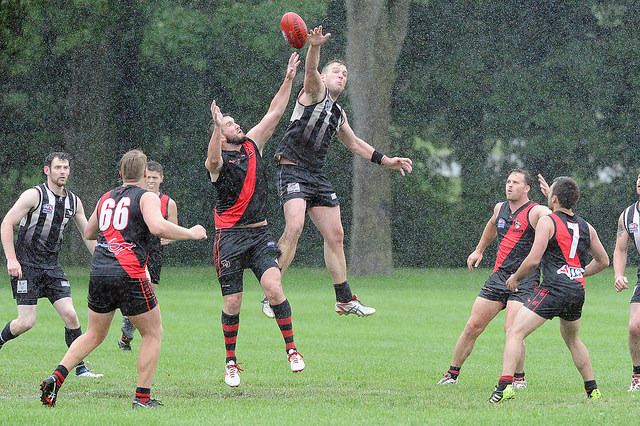 A light smattering of rain quickly turned into a drenching downpour as both sides lined up for the opening bounce. With the relentless rain and cold winds swirling, this was to be a classic wet-weather footy match – grinding, tough, and exhausting. Once again, the Dingos’ on-ballers led the way. However, unlike the precision deliveries seen in their victory versus Grand River the week before, Alex, Thumper, and Shauny worked tirelessly to simply get the footy on the boot and belt it forward. The wet, sloppy conditions allowed the Dingos to pin the Rebels deep in their own end and the Dingos managed to push through a couple of goals by the time the first quarter was over. The plan was the same for the next three quarters: pick up the footy, get it forward, pressure, convert. An exhausting match, but the big men up front – Wado and Fridgy – were able to take some marks and put majors on the board. At the back end, great efforts from Canadian veterans Wellsy and Ramma helped repel Rebel attacks and they used the run of Jimmy and Mike Karas to counterattack quickly. By three-quarter time, the Dingos were up 4 goals, but tempers were wearing thin and bodies in short supply as some Dingos went down with injuries. The Rebels pushed in the 4th, but some scuffling led to two Rebels being sent off the ground and the Dingos were able to convert on their chances. Their hard efforts were rewarded as the final siren rang with the Red & Black winning 7.8.50 to 2.8.20. BOG went to Wellsy, Thumper, Tom Bell, Alex, and Niall. Goals: Edwards (2), McNaughton, Serpa, Humphries, Aitken, Bell. 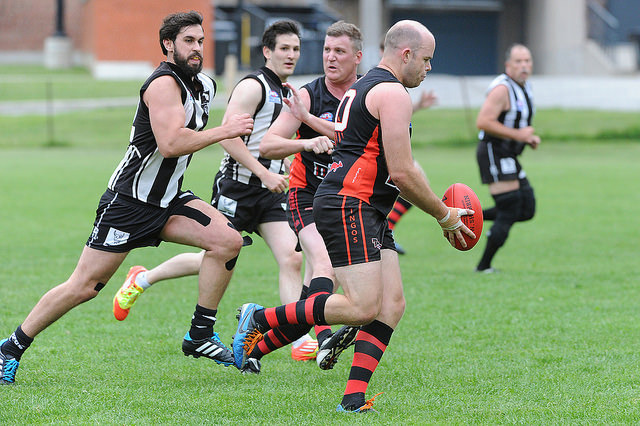 The Dingos Div 1 side now gets two weeks off before heading up north on their annual Ottawa trip to battle the Swans.